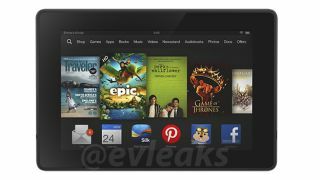 The launch of a new Amazon Kindle Fire tablet is probably just around the corner, judging by an official-looking press render, which appeared online this weekend. The leak, from the super-prolific @evleaks Twitter account, shows what looks to be a refreshed version of the 7-inch Amazon Kindle Fire, rather than the HD version. The render, which does not showcase a front-facing camera on the device, was posted along with the simple message "Another upcoming Kindle," on Sunday. Recent reports and leaks have pointed to an upcoming Kindle Fire refresh, with rumours suggesting there could be three new devices on the way before the end of the year. Expectations are that the devices will be launched in September or October - a year from the outing of the current generation, and in plenty of time for the Christmas rush. The HD version(s) of the device is expected to pack a Qualcomm Snapdragon 800 processor plus an Adreno 330 graphics chip. Speculation also mentions a memory bump to 2GB RAM. Naturally, you'll be the first to know when anything official goes down.